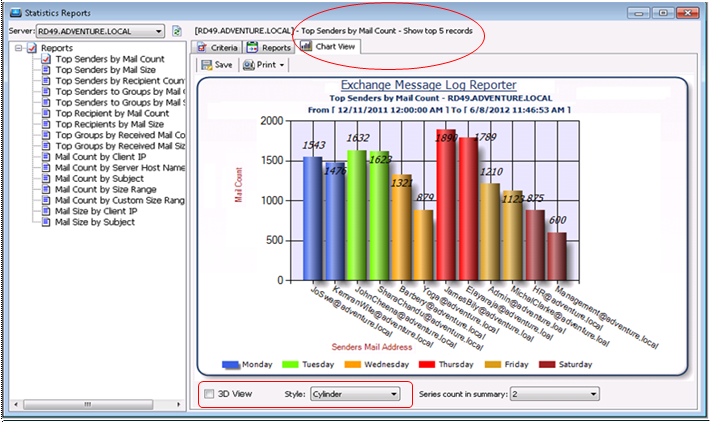 New version of Exchange Message Log Reporter v2.0 to report on traffic statistics of mail transactions. Various options are available to deliver these graphs to the end user or the management (as in the earlier version): Export (XLS/MDB/TIFF/HTML/CSV/PDF), Print, E-mail (instantly notify different users). An interesting feature in this new version is the option to generate graphical reports (Bar charts) including the usual tabular format reports. 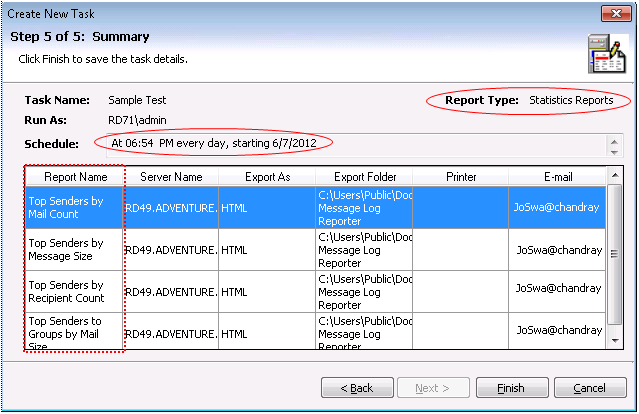 In addition, you can schedule Traffic Statistics report to run at specified time intervals. 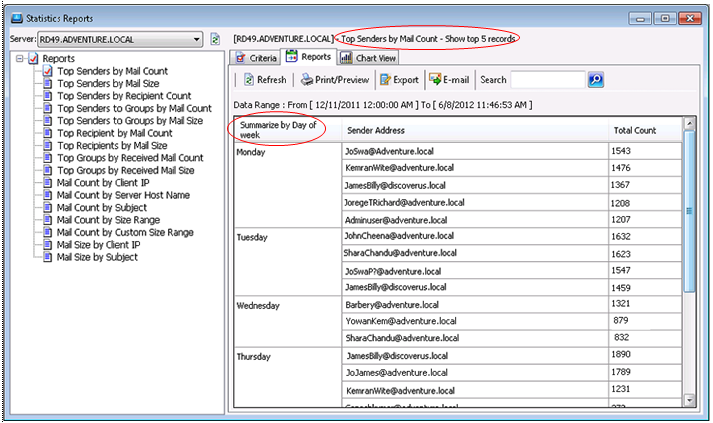 Here, the criteria specified picks the top five Senders by ‘Mail Count’ tracked in the recent 180 days. Click the ‘Chart view’ to display a graphical representation of the above report. Default view is two-dimensional. Check the ‘3D View’ box at the bottom for a three dimensional view and choose the bar chart style as desired. 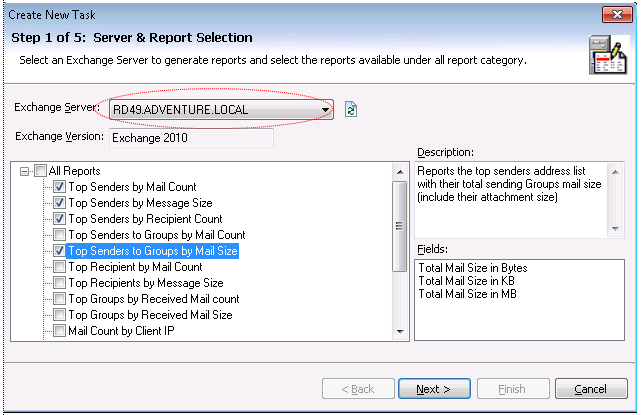 The Exchange Server mentioned is ‘RD49.ADVENTURE.LOCAL’ and you can check one or more report(s) to run multiple reports at the same time. 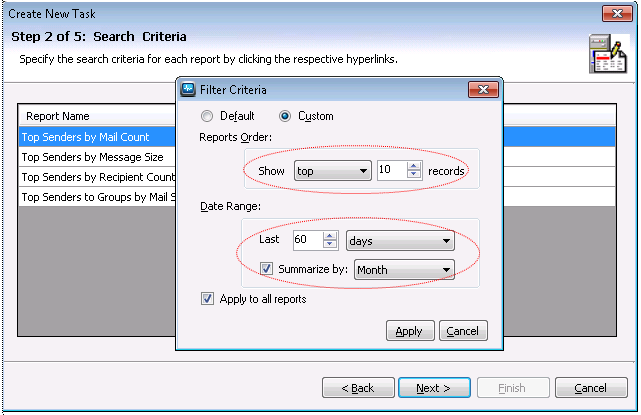 Filter the report to display the top 10 records tracked within the recent 60 days and summarize the results by month. 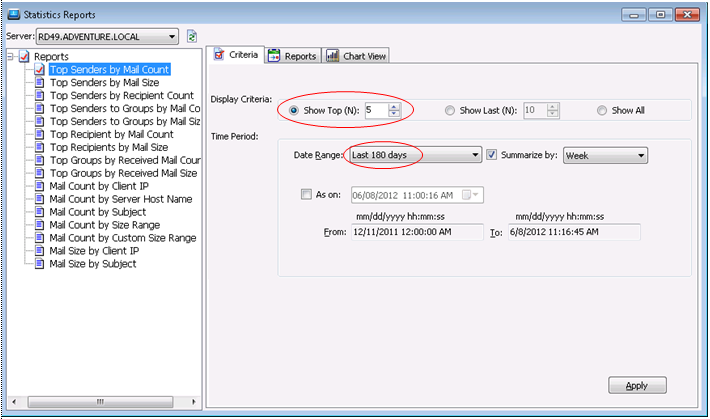 Other available options are ‘by day of a week’, ‘by week’, ‘by month’, ‘by quarterly’, ‘by half yearly’ or ‘yearly’. The task ‘Sample Test’ is scheduled to run daily at 06.54 PM. 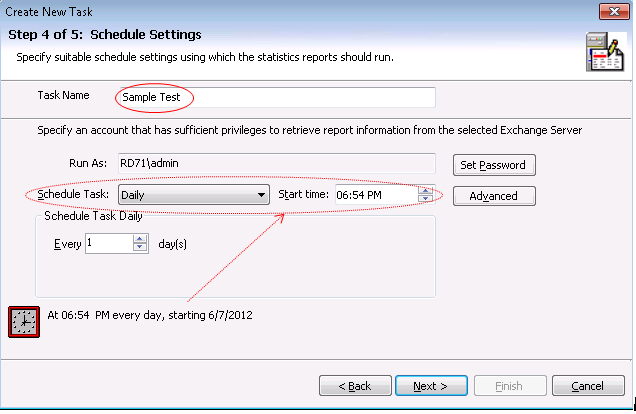 This wizard shows the task summary listing the multiple ‘Statistics Reports’ scheduled to run at a specified time interval.